3. Cerrahpasa Faculty of Medicine, Department of Surgery, Istanbul University, Istanbul, Turkey. MicroRNAs (miRNAs) represent a class of short endogenous non-coding RNAs that negatively regulate gene expression at the post-transcriptional level in many biological processes, including proliferation, differentiation, stress response and apoptosis. In this study we analyzed a set of seven miRNA molecules in sera of patients with papillary thyroid cancer, multinodular goiter and healthy controls to identify miRNA molecules that may have utility as markers for PTC. 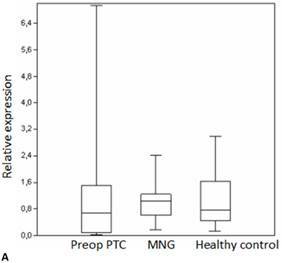 MiR-21 serum levels in the preoperative PTC and MG groups were significantly higher than the control group. Likewise, postoperative levels of miR-151-5p, miR-221 and miR-222 were significantly lower in patients with PTC. When serum miRNA levels were evaluated according to stage, postoperative levels of miR-151-5p and miR-222 were significantly lower in patients with advanced stages of the disease. The miRNA levels were also found associated with the size of the primary tumor. Our data imply that specific miRNA molecules which are differentially expressed in thyroid tumors may play role in the development of papillary thyroid carcinoma. Keywords: miRNA, expression, papillary thyroid cancer. Thyroid cancer is the most rapidly increasing cancer among women and the second among men . The number of new cases of thyroid cancer is 12.2 per 100,000 and the median age at diagnosis is 50 years. The disease is more common in women than men and among those with a family history of thyroid disease. Papillary thyroid carcinoma (PTC) accounts for approximately 80% of thyroid cancer cases. The prognosis of PTC is very good for the majority of patients. However, recurrences are observed in approximately 30 % of the patients and increasing incidence of the disease warrants further analysis of the molecular characteristics. Fine needle aspiration biopsy is currently the most useful diagnostic method to evaluate a thyroid nodule but 30% of the biopsies cannot provide reliable information on the risk of recurrences. Although somatic mutations act as drivers for approximately 70 % of the papillary carcinomas analysis of the known mutations does also not provide information on the recurrence and development of metastases [2,3]. Therefore, additional markers to identify and distinguish the tumors with high risk of recurrence are necessary . On the other hand, multinodular goiter is the enlargement of the thyroid gland and is not associated with malignancy [5,6]. Recent studies have revealed distinct abnormalities in the key pathways in thyroid tumors such as aberrations in epigenetic silencing, alternative splicing, aberrant gene expression patterns and single-nucleotide polymorphisms associated with susceptibility [7-10]. MicroRNAs are short endogenous non-coding molecules that regulate gene expression at the post-transcriptional level and can activate multiple oncogenic pathways in different forms of cancer. miRNAs bind to their corresponding transcripts interfering with their translation or inducing their degradation, thereby modulating all cellular pathways which are dysregulated in cancer. Aberrant miRNA expression is frequently observed in human cancer and has been associated with tumor development. Therefore, differential expression of miRNAs is considered a tumor-specific event which may reflect tumor behavior. Accordingly, some miRNAs have been reported to have clinical utility as prognostic markers or tools to evaluate the stage or progression of the disease [11-13]. Several studies suggest that miRNAs in sera may also act as potential biomarkers for different cancer types [14-16]. Recent studies aimed to evaluate specific miRNA expression profiles in thyroid cancer [17-19]. It has been shown that persistent expression of miRNAs may be crucial to maintain tumorigenesis . However, although differential expression of several miRNA molecules has been reported in thyroid cancer the results in the literature are highly inconsistent. Among the relatively high numbers of miRNA molecules very few have been found to have prognostic or diagnostic utility and only few studies have investigated the role of miRNAs in PTC [21,22]. Furthermore, the majority of these studies have low statistical power due to the heterogeneity and limited numbers of the study groups . Selected miRNAs have frequently been reported as being up- or downregulated in PTC compared with healthy controls [14,24-25]. The objective of this study was to evaluate several potential miRNA molecules as markers which may help in distinguishing PTC from benign tumors and identifying high and low risk tumors. We compared expression levels of seven different microRNA molecules in serum samples from a homogeneous group of patients with the same histopathological type of thyroid tumor. A total of 86 subjects including 31 patients with papillary thyroid cancer who were treated at the University of Istanbul, Cerrahpasa Medical Faculty, 31 patients with multinodular goiter and 24 healthy controls were taken into the study. Serum samples from the patients with PTC were obtained prior to and five weeks after the surgery. Data regarding patient demographics (age, gender) and primary tumor histopathology (tumor size, lymph node metastasis, TNM stage) were obtained by reviewing the patients' medical records. The study protocol was approved by the Ethical Committee of Istanbul Faculty of Medicine. All sera were immediately stored at -80°C until RNA isolation. Circulating RNA molecules were isolated from sera using the Tripure Isolation reagent (Roche, Mannheim, Germany). Briefly, 200 µl serum was mixed with 800 µl Tripure reagent and incubated at room temperature for complete dissociation of the nucleoprotein complexes. Following incubation, 0,2 ml chloroform was added and the samples were incubated at room temperature for 15 min. After centrifugation at 12000 g for 15 min, the upper phase was transferred into Eppendorf tubes and 0,5 ml isopropanol was added. The mixture was incubated at room temperature for 10 min and centrifuged at 12000 g for 10 min. The supernatant was discarded and the RNA-containing pellet was washed with 75% ethanol. Following washing, the mixture was centrifuged at 7500 g for 5 min. The supernatant was removed, air dried and resuspended in RNAse-free water. The RNA sample was incubated at 55-60 °C and was stored in -80 °C until use. Complementary DNA (cDNA) was synthesized using the miScript Reverse Transcription Kit (Qiagen, Valencia, CA, USA) according to the instructions of the manufacturer. During the first step of the reaction a poly-A tail was added to the 3'-end of the RNA molecules, while in the second step, cDNA was synthesized by the reverse transcriptase. cDNA synthesis was performed at 37°C for 60 min, and the reaction was terminated by incubation at 95 °C for 5 min. Quantification of the miRNAs was performed using the miScript Primer Assay (Qiagen, Valencia, CA, USA) which includes a universal primer specific to the poly-A tail and a miRNA-specific primer. The microRNA primers used in the study are presented in Table 1. SYBR Green (Qiagen, Valencia, CA, USA) was used as the fluorescent label for quantification and miR-16 was used as reference for normalization of the expression levels of the miRNA panel. Quantitative PCR was performed using the LightCycler 480 platform (Roche Diagnostics, Mannheim, Germany). The PCR reaction included a fast start step of 15 min at 95 °C followed by 45 cycles of amplification where each cycle consisted of denaturation at 94°C for 15 s, annealing at 55 °C for 30 s and elongation at 70 °C for 30 s. Melting curve analysis was performed to verify the identity and specificity of the PCR products. Relative miRNA levels were determined by calculating the ratio of the target and reference amplicons. Samples with a value of Ct >40 were considered negative. Specimens displaying very low miR-16 expression levels were excluded from the study. Statistical analysis was performed using the SPSS v15 statistical package program. All statistical analyses were performed using the Mann-Whitney U for intergroup and the t test for intragroup analyses. p<0.05 was considered as statistically significant. The microRNA molecules analyzed in the study. We analyzed the expression of seven different miRNA molecules for differences in aberrant miRNA expression and in terms of their utility to distinguish PTC from benign thyroid lesions by quantitative real-time PCR. 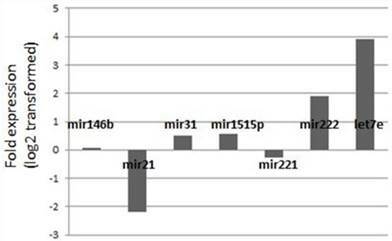 The distribution of the miRNA levels in the disease groups and healthy individuals are shown in Figure 1. miR-222, miR-31, miR-151-5p and let-7 miRNA levels were markedly higher and miR-21 levels were lower in the patients with PTC when compared with the healthy controls and benign tumors. However, a significant difference between papillary tumors and multinodular goitre was observed only for miR-222 (p=0.018). 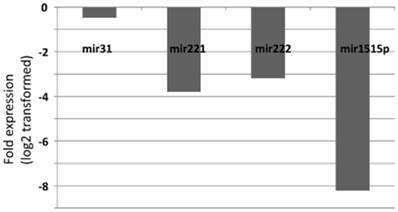 Between-groups analyses comparing the levels of the miRNA molecules in all three groups revealed a significant difference between the miR-21 levels (Table 2). 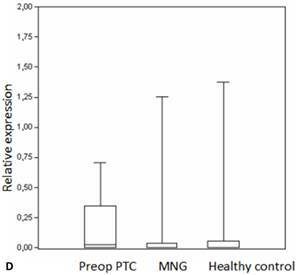 Pairwise comparison revealed that serum miR-21 levels in the preoperative PTC (p=0.002) and MG (p=0.007) groups were significantly lower than the control group while no difference was observed between the disease groups (p=0.35). When the differences between the pre- and postoperative patients were compared significantly lower expression of miR-221, miR-222, miR-151-5p and miR-31 were observed in the patients with PTC after removal of the tumors (Table 3). Evaluation of serum miRNA levels according to the stage showed a significant decline in the postoperative miR-151-5p levels in advanced stages (Stage III+IV) when compared with the preoperative levels. Likewise, postoperative serum miR-222 levels in patients with stage III+IV disease were significantly lower when compared to preoperative levels (Table 4). Serum miRNA levels in the patients with PTC were also evaluated according to the tumor size. Postoperative miR-222 levels were significantly lower than preoperative levels for all tumors (Table 5). Preoperative miR-221 levels in patients with tumors larger than 2 cm were significantly lower than the patients with smaller tumors. Postoperative miR-146b levels were higher in patients with tumors larger than 2 cm while postoperative miR-151-5p and miR-221 levels were lower in tumors smaller than 2 cm. The miRNA levels in the disease groups. The levels of the miRNA molecules in the pre- and postoperative patients with PTC. T test, * p<0.05, **p<0.005. Evaluation of the pre- and postoperative serum miRNA levels in the patients according to the stage of the disease. +Mann-Whitney U test, ++ t test, *p<0.05, ** p<0.01. Box plots of miRNA expression levels in sera of patients with PTC, MNG and healthy controls. A: miR-146, B: miR-21, C: miR-31, D: miR-151-5p, E: miR-221, F: miR-222, G: let7. The lines inside the boxes indicate the medians. Evaluation of the pre- and postoperative serum miRNA levels in the patients according to tumor size. Expression changes of the miRNA levels in the posterative versus preoperative sera. Fold-change profiles of microRNAs in papillary thyroid carcinoma versus healthy controls. Data represent the medians of relative miRNA levels (log2 transformed). We also analyzed to combine the data from the individual miRNA's in order to identify a possible combination which might help in distinguishing the cancer cases from the benign disease. However, none of the possible combinations achieved sufficient discriminative power as a differential tool which can be used in the clinical setting. Papillary thyroid cancer is the most common form of thyroid cancer. However, reliable molecular markers with clinical and prognostic utility are not available for PTC. Recent studies indicate that miRNAs can exert oncogenic and tumor suppressor functions by modulating key pathways during tumor formation and progression. Several miRNA molecules have been associated with tumor proliferation, invasion or metastasis indicating that miRNAs may also act as predictive biomarkers in cancer [11,15]. Circulating miRNAs are ideal markers for the non-invasive detection of cancer since miRNA expression is dysregulated in cancer and is usually tumor-specific, displaying a consistent pattern. However, it is still unclear whether circulating miRNA levels may actually help in the differential diagnosis or can predict prognosis of PTC. In this study we analyzed a panel of miRNAs in terms of their utility in the differential diagnosis of thyroid cancer and their association with the clinical parameters as potential biomarkers for the disease. miR-21 has been reported to aid in distinguishing the papilary tumor variants in a selected miRNA panel . In our study circulating miR-21 levels were downregulated both in the patients with PTC and benign thyroid disease compared to the healthy individuals. In an earlier study higher levels of miR-21 have been reported in tumor tissue when compared to normal tissue . It has also been suggested that higher miR-21 expression levels are detected in PTC tissue samples when compared to MG . This was not the case in our study. However, these previous studies comprised nine and ten patients, respectively and our sample size is three times greater. Although upregulation of miR-21 in the patients has been reported in some studies other reports failed to confirm this and decreased expression in the plasma has also been reported in subgroups of tumors . Furthermore, our data is in accordance with a very recent report which has found significantly decreased miR-21 levels in papillary thyroid cancer . miR-221 and miR-222 are overexpressed in PTC [27,31] and have been associated with aggressive tumors and adverse clinical characteristics [24,32,33]. High levels of miR-146b and miR-222 have been reported in aggressive papillary thyroid cancer [24,34,35]. Evaluation of the pre- and postoperative groups showed that miR-221 and miR-222 levels were significantly lower after surgery. A significant decline was also observed following resection of the tumors in patients with Stage III/IV disease for miR-222. Combined with the fact that preoperative miR-221 levels are higher in tumors that are smaller than 2 cm when compared to larger tumors this may indicate that miR-221 and miR-222 expression levels in the circulation may be associated with the tumor burden. This conclusion is in accordance with previous studies [27,36] and with a report suggesting that miR-222 is important for detecting recurrence in PTC . While postoperative miR-222 levels were lower for all tumors a significant decline of the postoperative miR-221 levels was observed only in tumors smaller than 2 cm. These findings support previous reports suggesting that miR-221 is one of the most sensitive miRNA molecules for thyroid cancer . Microarray data suggest that miR-146b is overexpressed in many cancer types, such as melanoma , lung  and colorectal cancer . The miR-146b molecule plays an important role in tumor progression by downregulating BRCA1 . We observed higher postoperative miR-146b levels in patients with tumors larger than 2 cm. This is in line with studies suggesting that miR-146b levels in fine needle aspiration biopsies may help in detecting and identifying thyroid cancer [14,24,42]. Our data support the observations that miR-146b is associated with the risk of recurrence and may promote cell migration and invasion . This finding is also consistent with the fact that an association with tumor size has been shown for several miRNA molecules . miR-31 and let7e molecules have been characterized as tumor suppressors in different cancer types [25,43,44]. Deregulation of let-7 is observed in different types of cancer. Let-7 genes are known to be highly expressed in the thyroid gland [20,45] and let-7 downregulation has been associated with thyroid tumors [30,46]. Serum miR-31 expression levels were not different between the disease and the control groups. A study has suggested that higher miR-31 expression is observed in tissue biopsy samples from oncocytic adenomas . In our study neither the PTC nor the MG samples displayed aberrant miR-31 expression. This is in concordance with a recent study which has not found differential expression of miR-31 between the normal tissue and thyroid tumors . Although much higher let-7 levels were observed in the patients with PTC the difference was not significant possibly due to the wide distribution of the values. However, discrepant expression of let-7 is also consistent with a previous study . miR-151-5p has been implicated in several pathological conditions as well as cancer , and was found to be correlated with the migration and invasion of cancer cells . Evaluation of the pre- and postoperative groups showed significantly lower miR-151-5p levels in postoperative patients with late stage tumors. This is in concordance with a previous study reporting a significant decrease of the miR-151-5p levels following tumor excision and is also in line with the suggestion that miR-151-5p is associated with lymph node metastasis and larger tumor size . In conclusion, in this study we demonstrate that a specific set of differentially expressed miRNAs are detected in the circulation of patients with papillary thyroid cancer. Several studies have shown a clear agreement between the miRNA levels in serum and tumor tissue in paired samples from different tumors in general [50,51] and in thyroid carcinoma in particular . Therefore, we suggest that miRNA expression profiling may have diagnostic value and help to monitor the progress of PTC. Long-term follow-up of the patients in the current study and studies in larger cohorts are necessary to prove the utility of these molecules in terms of clinical practice as biomarkers. This work was supported by the Istanbul University Research Fund (Project number: 32227). Corresponding author: Prof. Dr. Nejat Dalay, I.U. Oncology Institute, 34093 Capa, Istanbul, Turkey. Phone: 90 212 4142434- 34182 e-mail: ndalaycom.